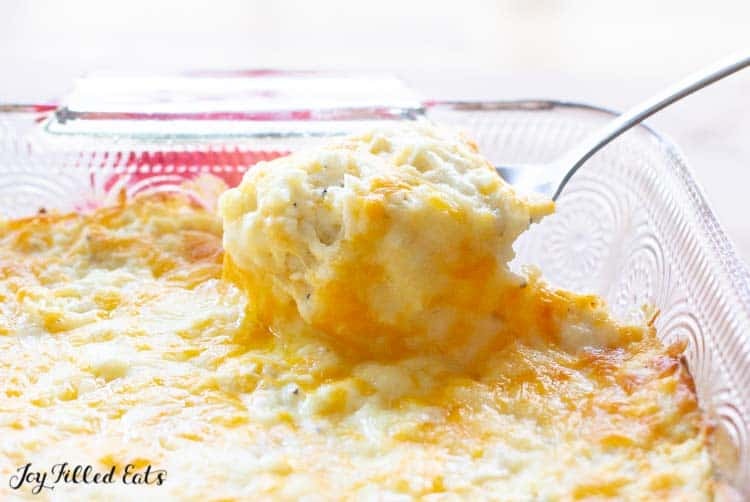 This version of the famous Cracker Barrel Hashbrown Casserole will satisfy your potato craving and trick your entire family. I frequently make potato dishes with cauliflower and my husband still could not believe this wasn’t actually potatoes! Cracker Barrel Hashbrown Casserole. That might be my favorite 4-word phrase ever. Anytime we are on a road trip and pop into a Cracker Barrel with the kids I have a hard time resisting a heaping side of cheesy, potato goodness. My kids have grown to love it too so I’ve made a few copycat recipes over the years using shredded potatoes and cream of chicken soup. It is a great make ahead for brunches. Whenever my kids have had a celebration like a Baptism or First Communion my favorite (and the easiest) meal to feed our guests is always brunch. 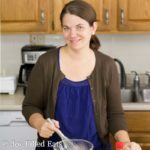 I make egg bakes, some coffee cakes, and a copycat Cracker Barrel Hashbrown Casserole. It is delicious but is definitely not the healthiest option. Therefore, a remake of this has been on my recipe list for YEARS. Every few months I would think about how could I possibly make the delicious, carb-loaded, fattening Cracker Barrel Hashbrown Casserole healthy? First, I thought over the different potato subs. Should I use jicama? Should I use radishes? What about cauliflower? And how on earth do I replicate cream of chicken soup? The more I thought on it the more my plan became solid in my mind. My favorite potato sub is cauliflower so I decided I would just use cauliflower. BUT I would only use the stalks of fresh cauliflower because I wanted a shredded texture, not the texture of the florets which is more rice like. This was the biggest part in disguising the cauliflower as a potato substitute. My family knows mashed cauliflower. And they know cauliflower rice. But shredded cauliflower? That is a new one. To do this I cut off the florets trying to leave as much of the stalk as possible. Then, I put them through the food processor with a shredding disc. One medium head of cauliflower had enough stalk for me to have the 3 cups of shredded cauliflower I needed for this recipe. I put the florets in a large plastic storage bag and roasted them for dinner a few nights later with some roasted garlic paste. To make the cream of chicken soup I needed a few creamy ingredients and some chicken bouillon. I cheated a bit and used a canned chicken broth concentrate paste. It ends up being 1/8 tsp per serving so it has a negligible impact on the nutrition facts. There is a link in the recipe card to a recipe to make your own version if you prefer to do so. A powdered chicken bouillon would also work. I made one about 6 months ago using nutritional yeast that was amazing. I could not believe how much nutritional yeast plus some salt and spices could taste like chicken. The rest of the ingredients in my remake of the Cracker Barrel Hashbrown Casserole Recipe were easier. I can do cheese, and onion, and more cheese. Who doesn’t love cheese? I chose to use a blend of shredded cheddar and Monterey jack but you can use whatever your family’s favorite cheese is. I served this hashbrown casserole recipe along with some baked pork chops. It goes well with breakfast, breakfast for dinner, or just your regular dinner as a side dish. Next on my to do list is to add shredded chicken into this to make it a one dish meal. If you try that make sure to let me know how it turns out! 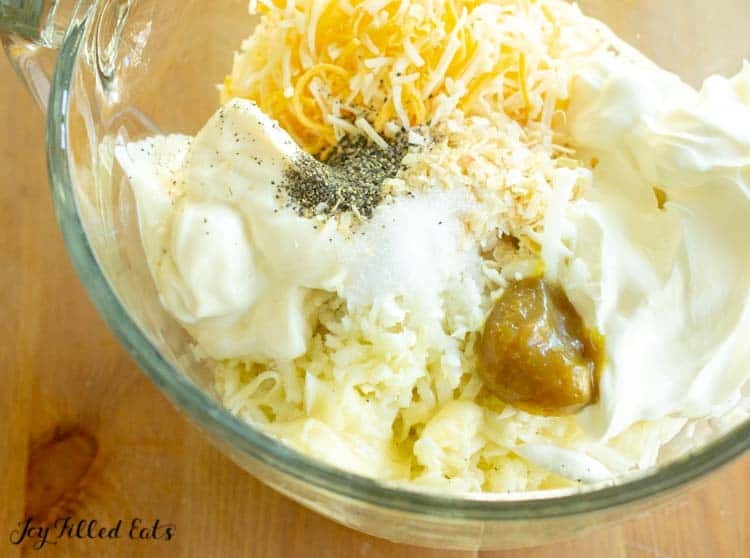 I hope you enjoy my healthy Cracker Barrel Hashbrown Casserole Recipe! 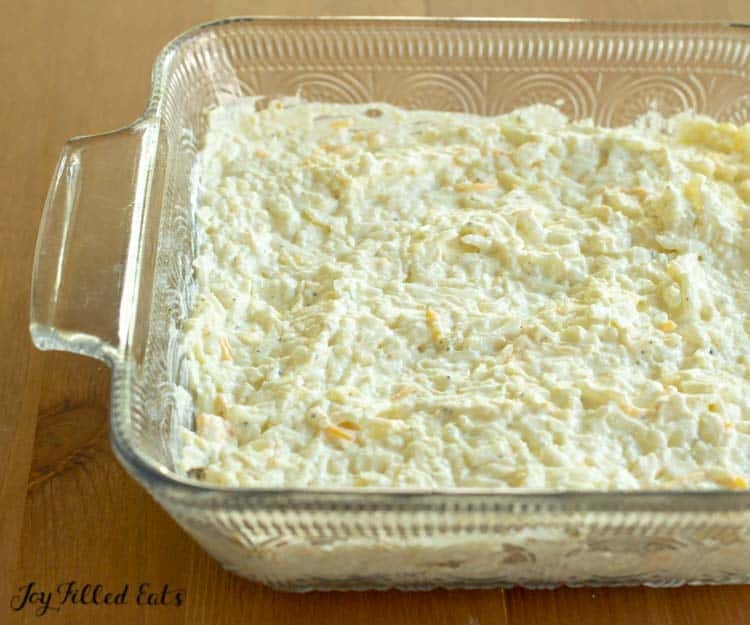 This version of the famous Cracker Barrel Hashbrown Casserole will satisfy your potato craving and trick your entire family. I frequently make potato dishes with cauliflower and my husband still could not believe this wasn't actually potatoes! Preheat oven to 350. Spray an 8 x 8 baking dish with cooking spray. Set aside 1/3 cup of the shredded cheese to use as a topping. Stir together the remaining ingredients. Spread in the prepared baking dish. Sprinkle with the reserved cheese. Bake for 50-60 minutes, until the casserole is golden and bubbly. I use the organic Better than Bouillon concentrate. If you prefer to make your own check out this recipe. THANK YOU for this recipe. I made it this weekend, and it tastes just like the real thing! I didn't really make any modifications, but I did thaw out a bag of frozen cauliflower rice and let it dry for about 30 min on some paper towel (instead of shredding my own). I used half sharp cheddar and half guyere/fontina blend from Trader Joe's; and I only had creme fraiche in the fridge. Absolutely delicious! I am excited to try. Thank you for the great recipe. What is the fiber content? I need to track my macros. My question is, texture aside, can you taste the cauliflower? I keep trying cauliflower dishes, but the strong sulfury taste always comes through. I can't disguise it enough for my powerful tastebuds! 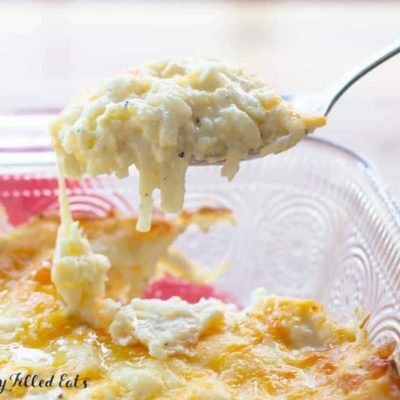 Do the cheese and sour cream overpower the cauliflower flavor? Think it would be ok to make this a day ahead, cover and pop in the fridge overnight? Then cook as stated? This was amazing! I hate thinking about how many cauliflower stems I’ve wasted all these years .My hubby loved it and I have the florets to roast this week. Thank you! I've wasted a lot too! I've started freezing them and then once I have a good amount I'll make this again. I'll be back to let everyone know how it worked with frozen cauliflower stems. 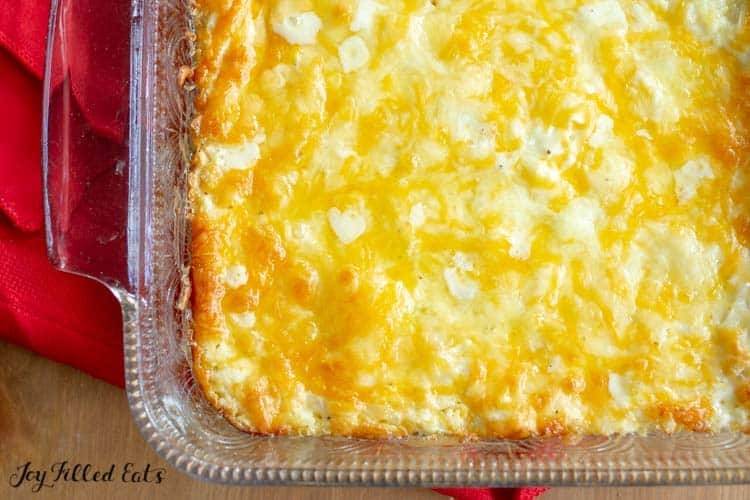 Cheesy hashbrown casserole has always been a fav of mine!! I'm excited to try this!! I always made mine in a crockpot do you think this recipe could be made in a crockpot as well? Yup! It should work with whatever cooking instructions you've used personally. Please come back and let us know how it turns out in the crockpot! You could use some powdered bouillion. I like to make my own with nutritional yeast. So, you bought cream of chicken soup? It would work to add it but the nutrition facts would be different. I'd reduce some of the other liquids to make up for it. How do you make the powdered bullion with nutritional yeast? The industry should offer cauli-slaw (they make broccoli slaw, so why not cauli-slaw? )- my husband and son had no idea it wasn't potatoes! That's a great idea! And I'm glad you liked the Cracker Barrel Hashbrown Casserole! Might be good with broccoli slaw too. Wow, this looks simply amazing !! I’m loving that you made it Keto n will be trying soon. 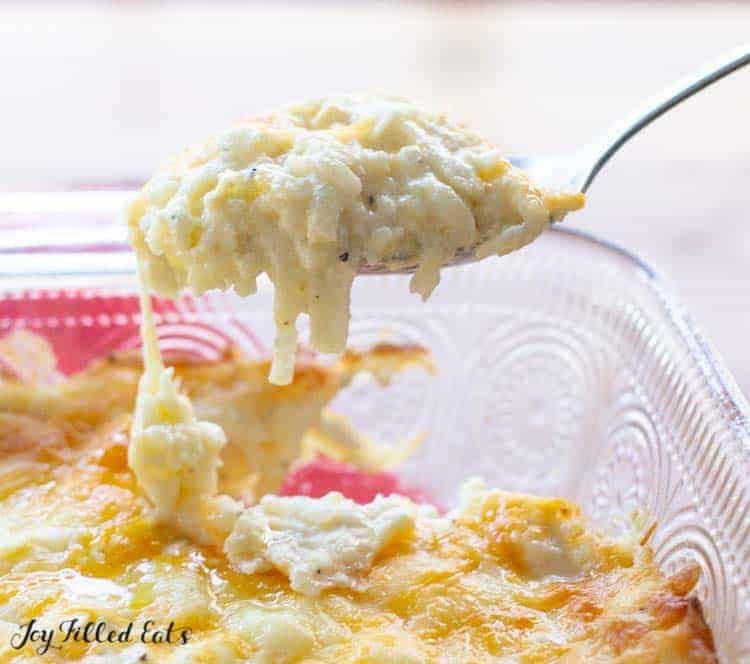 I absolutely love that you made this total comfort food low carb and gluten free!!! Yes! No grains at all. Ooooo, I am all about tricking the fam with cauliflower, because they often try to NOT eat it, saying it's not the same, but man, when you make it like potatoes, it's so good! Love the idea of a healthier copy cat recipe! 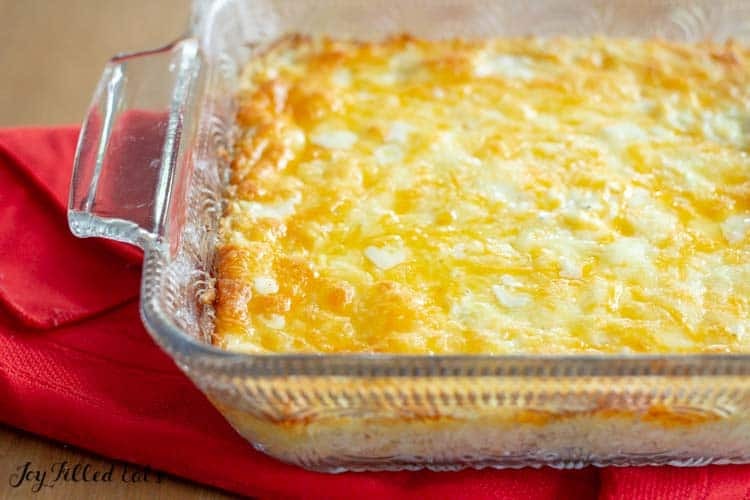 This hashbrown casserole looks so perfect! Any tips on how to shred just the stems? Yes, I give some in the post but can add more. Cut the florets off, leaving as much stem as possible, and then put the stalks through a food processor with a shredding disc. This is one recipe you really do need a food processor for. 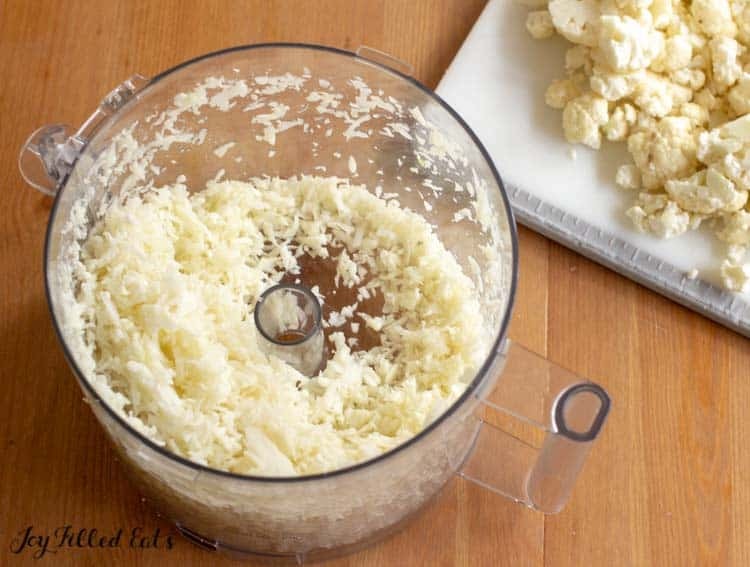 If you care more about the flavor you could just use finely chopped cauliflower or cauli-rice. You don't get the hashbrown texture but the flavor is the same. This looks soooo good! 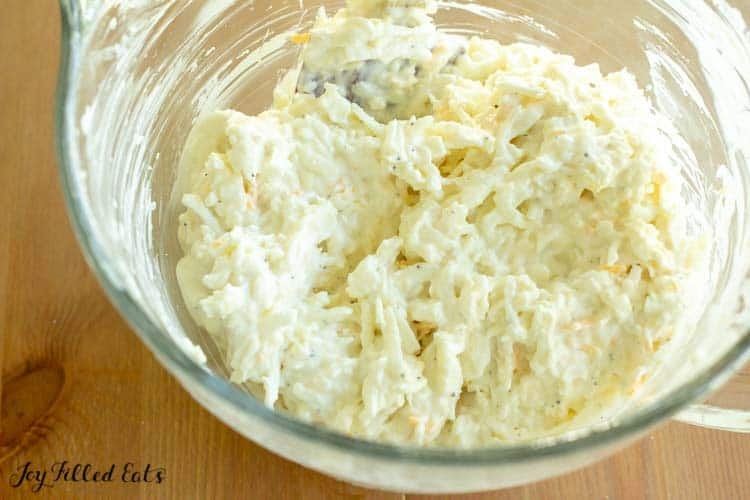 Do you think it would affect the flavor too much if I subbed greek yogurt for the sour cream?, maybe add a bit more butter to make up for the loss of fats in the sour cream? Thanks. Also thinking of cooking adding chopped pork chops right into this as well. Greek yogurt should work. Enjoy!